The most raved cleansing bar in 2018 for dry and acne prone skin is here! 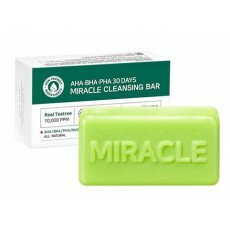 This miracle cleansing bar reduces the appearance of blemishes and skin irriations on your skin using the powers of AHA, BHA and PHA, and 2% Niacinamide. Use it in 30 consistent days for best result! After rinsing your oil based cleanser, lather the soap on your hands and gently massage on the face. Pay particular attention on these areas: on the cheeks, forehead and chin using circular motion, around and over the nose, as well around the eyes. Rinse thoroughly and follow with Some By Mi Toner for effective result.